Keep children busy with this brand new series! Each notebook contains 45 games, divided into 3 categories: puzzles, observation games, and mazes. 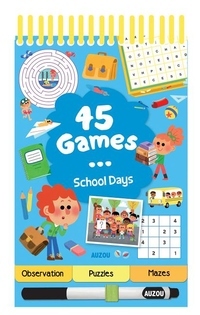 All games are organised around a single theme such as back to school or travelling. The erasable pen enables children to start over again and again! All the answers can be found at the end.